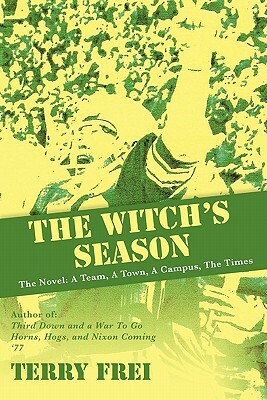 In The Witch's Season, acclaimed author Terry Frei turns to fiction. On one of the nation's cauldron campuses during the 1968 Nixon-Humphrey presidential campaign, Cascade University President Neal Hassler is caught between militant students and an irate citizenry. Under statewide criticism, he is defiant in public as he unravels behind the scenes. His primary student antagonists are SDS leader Annie Laughlin and Jake Powell, chairman of the Campus Coalition Against the War. They're close to student journalist Kit Dunleavy, who struggles to balance her relationships with the radicals and her theoretical objectivity. Complicating matters and infuriating fans, Jake also is a starting linebacker for the Cascade Fishermen football team, expected to challenge O.J. Simpson and the USC Trojans for the Pacific 8 Conference title. Coach Larry Benson, a World War II pilot criticized for allowing his players to participate in campus politics, faces pressure to both tighten the reins, especially with Powell and star tailback Ricky Hilton, and win at all costs. Amid campus and national unrest, the Fishermen - an eclectic group with several star players and bright young coaches destined for bigger things - encounter triumph, controversy, and disappointment. Ultimately, the ensemble cast's fates are intertwined in a fall that becomes The Witch's Season. "Events carry the story forward swiftly, and that alone would make it a good read. But Frei has a larger point to make. It's during times of upheaval, when the very foundations of normalcy are being shaken, that personal courage, honor and the willingness to stand fast on principle matter most. All of the central characters in Frei's story will have to decide whether to make that stand, and if so, how to make it. Frei has written three nonfiction books, most notably Horns, Hogs and Nixon Coming. This book proves he can write fiction too." -- Ken Goe, Portland Oregonian. Terry Frei writes for The Denver Post. His previous books are Horns, Hogs, and Nixon Coming, which the Dallas Morning News labeled "a superb blending of sports, history, and politics"; Third Down and a War to Go, with a foreword by David Maraniss; and '77: Denver, the Broncos, and a Coming of Age.